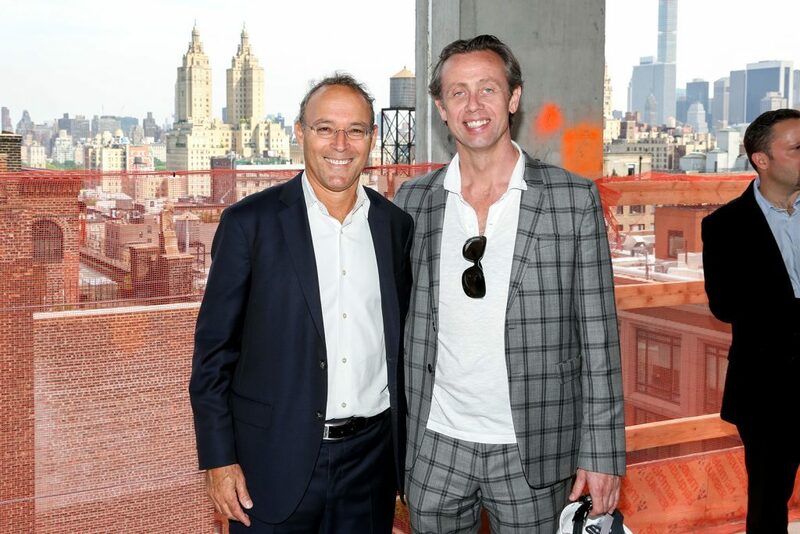 The Naftali Group announces the topping out of 221 West 77th Street, a Thomas Juul-Hansen designed 26-unit luxury condominium, located between Amsterdam and Broadway on Manhattan’s Upper West Side. 221 West 77 is Naftali’s second boutique condominium on the block; the first, 210 West 77th Street, topped out in October 2015 and is 92% sold. The two buildings have completely transformed the street. In May, Naftali entered into multiple contracts on five residences at 221 W. 77th. Townhouse East, a four bedroom four and a half bathroom duplex, and Townhouse West, a five bedroom five and a half bathroom duplex, each with expansive backyards, are now in contract. Additionally, contracts signed on 10E and 11E, both three bedroom three and a half bathroom apartments, as well as a full-floor five bedroom, four and a half bathroom residence on the 15th floor, complete the recent sales activity. These five units had a combined asking price of $39,125,000 million. 221 West 77th Street offers 26 homes ranging from two- to five-bedrooms and boasts layouts spanning 1,715 square-feet to 5,992 square feet. Units are comprised of half- and full-floors, as well as two townhouses and an expansive penthouse. Kitchens were designed by the renowned firm Smallbone of Devizes and highlights include Miele appliances, solid white oak floors, Marianna Soapstone countertops and backsplashes, Dornbracht fixtures, and a stunning Potomac Marble customized walnut table. The bathrooms are elegantly outfitted in Andromeda Marble and blackened rift cut oak accents. Building amenities include a 24- hour doorman, a state-of-the-art fitness center, residential parking spaces available for purchase, a paneled billiards room, a unique half-sized basketball court, and a spacious landscaped rooftop terrace offering comfortable seating around a gas fire bit, boasting excellent views of the neighborhood. “This boutique building with its expansive layouts and great amenities in a prime Upper West Side location is attracting interest from both hyper-local families and downtown buyers. We’re also seeing buyers from 210 West 77th referring friends across the street because they want to share how truly amazing these buildings are,” said Alexa Lambert of Stribling Marketing Associates, the exclusive sales and marketing firm. In addition to acclaimed cultural destinations like the American Museum of Natural History, New-York Historical Society and Children’s Museum of Manhattan, the building is conveniently located near several cult fitness and foodie hot spots. Fitness junkies are close to Equinox, Soul Cycle and Pure Yoga; plus its close proximity to eateries such as Momofuku Milk Bar, Jacobs Pickles and Shake Shack, and gourmet markets including Citarella, Fairway and Zabar’s make living at 221 West 77th tremendously appealing. Available apartments range from $4,050,000 for a two-bedroom and up to $12,750,000 for a five-bedroom residence. Occupancy is slated for spring 2017. For information on 221 W. 77th Street please visit here. Naftali Group currently owns, operates and is developing 15 residential properties in prime neighborhoods throughout New York City made up of more than 1,000 units and approximately 1,337,000 square feet. As a builder, owner and operator, Naftali Group’s portfolio includes 221 West 77th Street, The Shephard at 275 West 10th Street, 182 West 82nd Street, 210 West 77th Street, The Seymour at 261 West 25th Street, 234 East 23rd Street, The Arthur at 245 West 25th Street, The Landmark Park Slope, The Bergen, 33 Beekman and other multifamily assets and investments throughout New York City. For more information please visit www.naftaligroup.com.